Kookaburras are the largest members of the kingfisher family. Made famous by the Australian folk song “Kookaburra” by Marion Sinclair, kookaburras perch in trees and vocalize loudly. The birds’ loud, raucous call has been used in hundreds of “jungle” movies set in Asia, Africa and the Americans, although the birds are found only in Australia. The best time to hear a kookaburra vocalize is shortly after dawn and just before dusk. They vocalize in groups. These birds are active throughout the day but may choose to spend time in their heated enclosed areas on cold or rainy days. In the wild, kookaburras live in communal flocks where they claim territory by singing at dusk and dawn. These are common birds, with no specific habitat associations. They also are generalist predators on any small creature or eggs. With these wide ranges of preferences, these birds do well in both native and human-developed areas. 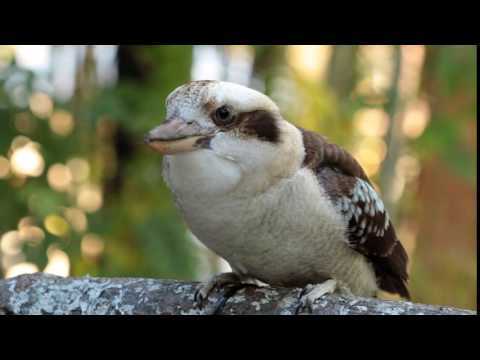 The name “kookaburra” is an Aboriginal name. Australian Aborigines say that when a sun rose for the first time on earth, the god Bayame ordered the kookaburra to utter its loud laughter to wake up mankind so man could not miss the wonderful sunrise. Kookaburras can reach up to 15–17 inches in length and weigh as much as one pound, and females are larger than males. They are a predominantly brown and white bird with brown eyes. Their body is a cream color, with a darker brown mask that streaks across the eyes. They also have a very large bill, with the top half being a very dark brown to black and a white to cream bottom. Kookaburras live in small family groups that travel together. During the breeding season, both sexes vocalize for each other and occasionally offer each other food. The female will then use a tree hollow to raise and nurture her chicks. Brood sizes tend to be small, usually with two to three eggs. Chicks are born with a small hook on their beaks. The purpose of this hook is unknown, but it falls off at the time of fledging. The range of the kookaburra includes eastern Australia, southwestern Australia and Tasmania, with small introduced populations in New Zealand and New Guinea. Kookaburras are not very selective about their preferred habitats. They can be found in a wide variety of generally drier areas with woodlands and clearings and are tolerant of human activity. Wild kookaburras prey on a wide variety of small animals, including large insects, frogs, snakes, rodents, smaller birds and bird eggs. At Zoo Atlanta, we mimic their wild diet with a variety of mice, nutritionally balanced whole-carcass ground meat, crickets and mealworms. It’s a summer of #BirdbookLive!